If you are using wordpress as i do, then you most probably know of one of the best WordPress plugins for forms of any kind, CForms II. CForms has been around for quite some time, it’s now on version 10.1, and we must admit that a lot of great work has been done making this the best form mailer plugin on the WP plugins repository. In light of special circumstances, cforms will not continue to be available on wordpress.org. 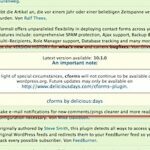 Future updates may only be available on http://www.deliciousdays.com/cforms-plugin. Anyone wonders what went wrong?? Well i did! And here is what i found out!